The Green Lake and Wallingford Paving and Multi-Modal Improvements project (new name!) is the city’s official name for work to be done up by Green Lake, but also includes a host of improvements and renovations along 40th St. These include addition of and improvements to cross walks; repairing sidewalks; installing some bus shelters; adding and improving pedestrian lighting; repaving of 40th; and construction of a bike lane. While the sidewalk repair garnered some criticism when it was revealed that a number of trees might have to be cut down to facilitate that, the greatest controversy was generated by the bike lane. The lane, separated from traffic by pylons, would run from Stone Way to 7th Avenue (where it would meet the Burke Gilman Trail at the awkward, 5-way intersection at the western edge of the UW) along the south side of the street, and would eliminate all parking on that side of 40th. This upset not only people accustomed to parking there, but folks nearby on the side streets who would find themselves competing with additional cars for space along the curb. An article I wrote about the bike lane back in March generated 200 comments from readers. Our original design for improvements on N 40th St responded to public feedback expressing the need for improved east-west bike connections through Wallingford. During our recent outreach, however, we heard concerns about our plans to add a protected bike lane on 40th, from both nearby neighbors and businesses, as well as from people who bike through the area. Given these concerns, and existing east-west bike infrastructure already in the area (via the Burke-Gilman Trail and the Neighborhood Greenway on N 44th St), we’re taking a step back to reconsider the design for bike improvements in this area. In the coming months, we’ll evaluate other potential improvements to east-west bike connections in Wallingford. We plan to share these alternatives with the community for feedback early next year. Although I’m an avid bicyclist, I wasn’t too excited about the prospect of a bike lane on 40th; there are just too many cars there, so I think I would still opt to bike on 39th or 41st. 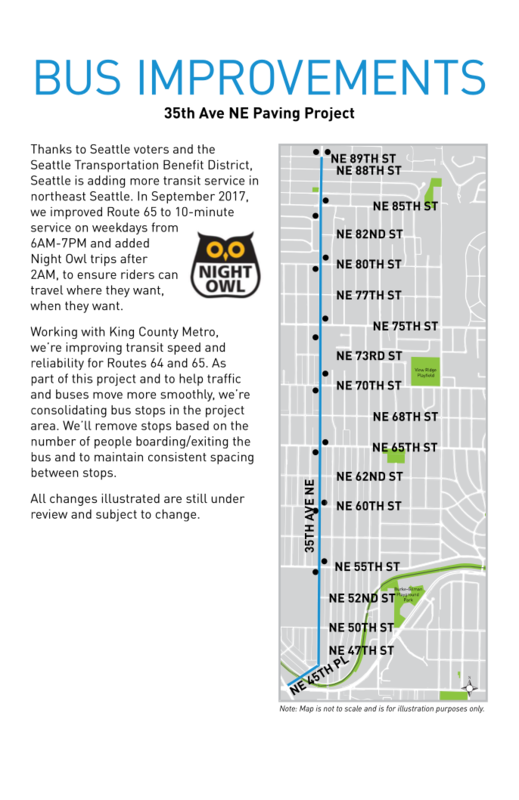 SDOT cited the proximity of other east/west bicycling options (the BGT and the Neighborhood Greenway on 43rd and 44th) as among the reasons they are reconsidering the 40th St. bike lane. I also wonder how much the rancor spawned by the 35th Ave. bike lane weighed on their minds. The BGT near Gasworks is one of the most dangerous stretches of that trail. I’d rather ride 40th. Neither 39th or 41st connect Stone to 7th…both peter out around Eastern Avenue. I’d rather ride 40th. The Neighborhood Greenway on 43rd and 44th is too narrow for both bikes and cars. I’d rather ride 40th. But apparently the Car Storage Lobby has prevailed and I will not be riding 40th. Not a shock in a city where the Ballard Missing Link is still 20 years in the planning stage. I think find a way to fix the Burke-Gilman Trail around Gasworks may be the best choice. That stretch is heavily-used but is very weird. Maybe they should block off the road connection between 34th and Norhlake for most of those intersections. I think SDOT could use practical advice from cyclists. The mess that is Burke-Gilman certainly suggests that. I can’t guarantee your advice would go anywhere if you offered it to them, but I would hope there’s some way for that to happen – for cyclists who aren’t hung up on scoring victories for their side, as your rhetoric does sort of suggest. Cyclists who can accept that a cycle path on a narrow, steep, heavily used arterial isn’t going to happen, but who can think creatively about what’s needed and what can work. For example … 41st peters out after Eastern? The pavement does, but the city presumably retains right of way through there. The other end looks like unmaintained jungle, from the online street view. When riding the BGT through the Gasworks Park area I get off the trail at the east end of the park and ride on Northlake Way over to Stone Way. It’s much straighter and in my opinion safer than staying on the BGT. Northlake Way is nice now that it’s been repaved. The BGT could definitely use some redesign in the Gasworks area. The main SDOT argument for cancelling the 40th street bike lane is that there wasn’t room for a bike lane on both sides of the street, meaning that cyclists would need to use sharrows on downhill portions. SDOT decided that removing the parking while requiring cyclists to use sharrows on a very busy arterial was a bad trade off. Additionally, 40th is listed as very low priority in the bike master plan. This is from the presentation SDOT made at the last WCC meeting. SDOT says they’ll be looking for other east / west routes to develop. My preference would be for SDOT to develop the regional greenway on 46th so people in the urban village can access the new 45th street bike crossing that will be going over I-5 so people can get to light rail and UW. The money could also go towards Burke Gillman improvements on that stretch. N 40th because of the steep grade on both sides of the hill. So you mean the problem includes very few people, and most of them own million-dollar properties? Maybe the solution is for those people to build a driveway? How about no bike lane but also no parking, but expand the sidewalk so the tree can have room for roots? Because there’s no possible any other way imaginable they could do anything else. Or…no, no, it’s too much to imagine …a neighbor might even offer the use of one of their extra parking spaces, in the special single family neighborhood where (as I’ve read online) peopel know each other kids grow up playing together and lifelong friendships become like family. But share parking? No, no…unpossible…. The issue is also that even if you primarily bike or use transit, the vast, vast majority of people also use a car for at least some of their transportation needs. The zero car family exists, but is exceedingly rare. Therefore, the cars have to be parked somewhere. Part of the issue is if they can’t be parked on 40th, then the car traffic is diverted onto neighborhood streets, which people on the neighborhood streets really don’t want. Not just the parking issues, but the additional traffic as well. I certainly understand the philosophical argument about the highest, best use of a public rights-of-way and what that use should be, but reality is that most people need a car at least some of the time, and slapping down a few sharrows doesn’t change that reality. So it gets down to telling people to build a driveway at their own expense because riding on the protected bike path just a couple blocks to the south is completely unacceptable, and we refuse to accept a bike path on any other street but 40th….wait? Does that make sense? Could you sell that idea to a neutral observer? Now, we might be able to change the car-based reality a little bit by providing more transit options. That would be acceptable to the bike lobby right? Wrong! The 35th bike plan plan calls for the removal of eight transit stops to accommodate bikes. All we have to do to keep the transit is move the path one block to east, and then we could have bikes AND transit. But the bike community (at least the vocal ones) demands require the removal of transit. For the same reasons DOUG mentioned. They want to ride on 35th and only 35th. And if you disagree, you are a climate arsonist. Or you are in favor of murdering children. Take your pick. Shoot, you don’t even have to pick. They’ll accuse you of both. All for the crime of wanting convenient bus service–which really does take cars off the street and provide opportunities for bike lanes. The crazy part is this isn’t even new bus service, they want to get rid of existing bus service. If the CBC would stop stabbing their natural allies in the back, maybe we could accomplish something. I won’t hold my breath. Speaking of removing transit for bike lanes, I heard today that they’re planning on shortening the existing SLU trolley line, by 200 feet at the cost of $10M, just to put in an arterial bike lane. Granted, I need to verify this. But if true, it’s just another example of the waste that occurs when we allow the CBC to have such an outsized influence on city hall. My neighbor is on a 1,500SF legacy lot and has an extra offstreet space. We’re on a legacy 2,500SF lot and have an extra off street space. Many of us in Walligford have larger lots and six or seven figure home equity, and larger lots. Maybe if people would take the slightest minmal action to see to their own parking needs or help out their neighbors, street parking won’t be an issue. We could acomplish a lot of folks were willing to exert any effort at all. Bur I won’t hold my breath. The 35th Ave project does *not* remove bus stops to accommodate bikes. It removes stops to even out the spacing, which makes bus service faster. For example, there are currently stops 600 feet apart at 60th and 62nd streets. If you walk at 3 mph and start in between, that’s a 1 minute walk to either one. With 62nd St removed, the new spacing is a little over double, at 1,330 ft (¼ mile). If you start in the middle, your walk is now 2–3 mins to either stop. This is already the existing gap between other stops along 35th, like 70th–75th. Meanwhile, everyone riding the bus saves time on their commute, and arrival times are more consistent. What if the changes were flipped on their head, and rather than removing stops from 35th to be more like the rest of the city, we were going to add stops to the rest of the city’s routes to make them more like 35th? Would you support that? Would you consider that more “convenient” if every bus stopped at every block, across the city? Removing the stops has *nothing* to do with what cyclists want or need, and everything to do with improving transit service. A project that includes a bike lane is not necessarily a bike project exclusively, and not all changes made in that project are automatically for cyclists to the detriment of everyone else. In general, though, we always want to push stops as far apart as possible while still providing enough access, both for speed and, because the fewer stops we have, the more infrastructure we can afford to provide at each. Which of these two stop layouts makes more sense? No way free parking is making sense to a neutral observer. It’s public space, and parking is a less efficient way of using it, comparing to car lanes, bike lanes, sidewalks, or tree growing spaces. Look at how expensive land has become in Seattle, and in which way can we justify giving it out for free for the benefit of so few? Especially in this neighborhood where housing price is so high? At least we should support getting rid of all free street parking. All that wants to park in streets should pay. Many of us spent lots of time getting estimates on redoing driveways so they could be used. The costs were between 10 and 20k. The problem is that among those who could afford to do this, there was still the issue of visibility. I contacted SDOT and asked them for advice about backing out into a bike lane and busy street and they did not reply. I do not know anything about this as I have never had to back out into a busy street. I certainly do not want to hurt anyone. By the way, Ron Johnson is not running for office again in our district. He mentioned that part of his decision was based on the push back he received against his support for the bike lanes. I assume he did this because he believes he can not win a re-election. How do the 40th St bike lane proponents interpret this? One interpretation is that the majority is against the bike lanes. I assume he believes that the voters count and that the majority rules……There are remedies for sour grapes. I am not sure the issue of getting in and out of the drive way is really that unique an issue. It’s obviously what many people do. I think DOL, as the one that regulate and validate your driving, may be the better source of info. And effectively you should treat the intersection of your drive way and the sidewalk as the stop sign according to law. If you truly don’t want to hurt anyone with your car and is not sure about your driving, you shouldn’t drive.For backing out, get a car with radars and cameras to assist you if you must. I am not sure what’s the point speculating what Rob Johnson is thinking. Are you just trying to speculate if there are a lot of people who think like you? Not sure how that can be a meaningful discussion, since we can only speculate instead of validate. I will not have to, because you lost and so did Rob Johnson. Read the article in the Seattle Times. I am not speculating, he said that his failure on the bike lanes is why he is not running for re-election. Furthermore, my driving is excellent. Many driveways have walls around them so it is difficult to see when backing into the sidewalk. You jump to conclusions about my driving and do not do the necessary research. Read what Johnson said. You are just a poor loser. Rob Johnson claims he promised he would go only one term. The terrific thing about that, he points out, is that he doesn’t have to worry about whether his constituents feel he represents them. The bike lane issue is only one example of that. You are correct, the reporter surrounded Johnson’s quotes with all the opposition that Johnson has faced. He wrote: “Some constituents will be happy to see Johnson go, including those who think the tax hikes he supported are making Seattle too costly. His harshest detractors include upzone opponents in Wallingford who argue developers are conning City Hall and people opposed to a 35th Avenue Northeast bike lane and road redesign. That project is the issue on which Johnson has taken heat most recently and intensely, drawing opposition from five community associations, dozens of businesses and thousands of petition signers, according to the Save 35th Ave NE group. So, he decided to not run because he wants to spend more time with his family. Yes. Would like to see that reference. i don’t think he said that. Rob Johnson has been supporting HALA, though he does not live in one of the urban villages of single family homes which is being proposed for multi use buildings, ie. condos which the developers will provide no parking at all for as many as 40 people with one or two cars. He has not advocated for his district. I didn’t jump to conclusion with your driving. You are the one using your incapability to handle backing out of the driveway as an excuse for having street parking. Hah Hah, you lost big time. You wanted bike lanes on 40th and they are not going to happen. Grow up and you will be a happier person. Backing out on to N 40th Street is hazardous as vehicles traveling N 40th frequently exceed 30 mph, the tree trunks often block oncoming traffic too. Hence my recommendation of using eminent domain to claim additional land next to 40th and expand the street to put in bike lane, wider sidewalk, and more space for tree. Well, you can recommend all you want, but it will never happen. Sounds like a real failure to me. Part of a meaningful discussion is not suggestion to anyone to get a car with radar and cameras,that is for sure. As a general thought, backing out of a driveway onto a busy street is pretty dangerous, especially without perfect sighting on both lanes, which is rare. Without parking, the sight would be good. A stretch of 50th is like that: many people there have to back into a busy street. Way busier than 40th actually. However, the sight is better with no parking. Backup camera isn’t that expensive and many options are very easy to install. I would be OK if the city pay each house on the 40th $200 as a one time fee to remove all the parking. Maybe bike owners should pay a yearly registration fee as car owners do if they are going to be using the streets. Free parking is becoming more and more difficult as the cost of the RPZs for neighborhoods is around $65 a year. Additionally, studies have shown bicycle use drops as much as 58% during rainy weather…..which Seattle is known for. Any independent observer can tell you $65 a year is way way way too low for a place where the price per square foot is above $600. $2000 a year would be a reasonable price. I am sure you can calculate the road usage/damage of a bike vs a car, and realize it takes more money to actually maintain a registry system than the right equivalent income you’ll get from such a fee. I can not believe that I agree with tj on something — $65 is low, especially when you consider that this is NOT for one year, but for TWO years. This should be a wake-up call to all of us who have been complacent and allowed a small group of people, relative to the rest of the population, to try to dictate policy for the rest of us. We should have fought back early on and not waited. Fortunately, SDOT has listened and done two positive things: extended the RPZs and cancelled the 40th St. Bike Lanes. Million dollar properties also pay around $10K in property taxes too. Some properties don’t have room for driveways. Are you trying to provide even more proof that million dollar property owners should have no problem fixing up their drive ways? Or are you somehow arguing the property tax includes street parking fee? My house is estimated over a million based on those real estate websites and I did pay to have my driveway broaden. I’m sure I don’t pay less property tax despite having a functional driveway. I am willing to exchange this for an apartment in the high-rise in this neighborhood. I actually used to rent in University Plaza, the second tallest building in the University District. Vision Zero, as long as it doesn’t impact or give the perception of impact to people who store their personal property in the public right of way for free. This is standard SDOT process. Look for another project in 2 or 3 years which will similarly be stymied by the free car storage lobby. Sharrows empircally do not increase bike ridership and they do not increase safety for bicyclists. SDOT’s policy of trying to force every mode of travel on every arterial has been a clear failure, especially from the standpoint of trying encourage bicycling. I’m glad SDOT is taking a breather and stop rushing into unforced design blunders that will simply have to be corrected later. You are totally correct. It is called Social Engineering. Many people voted for large packages and had no idea that they would be submitting to the will of 2% of the population. Now that they see what these lanes mean, they are voicing their opinions and the bike proponents are in shock. So happy to see Rob Johnson go!!!!!!!!! And in the case of the N 40th st project, it wasn’t even close to 2%. SDOT’s own studies showed that on 40th there are 11,500 car trips per day. And the number of bicycle trips? So that works out to 1/4 of 1%. But I’m sure, as the bike activists say, if we build it they will come, right? Funny how the keep saying that with all the bike lanes they’ve built, and the their citywide percentage of users has actually *dropped* to 2.8%. Now if we could just get SDOT to start considering the residents and businesses along Stone Way. The exclusive bike lane lobby has convinced them to remove all the parking from45th to 52nd. The biggest reason for that: housing price. Bikes are for two groups of people typically: the poor that uses it because it’s cheap, and the upper middle class that uses it as a form of exercise. Seattle is losing its poor. There is no housing for the poor in these neighborhoods, so there are no poor that uses the transportation format that’s good for them. We see no increase of bike lane usage in our neighborhoods because of that. Your line of logic of using the numbers but not understanding them is what has been driving the wealth segregation in the US. Seattle is already very segregated by wealth. I don’t understand what’s your comment on the residents and businesses along Stone Way meant. Stone Way is just about the worst example for anybody who wants to argue for any specific type of businesses or residents, because it’s going through a rapid transition with both the businesses and residents changing composition. How would you categorize as typical on Stone Way? People who live in condos and would bike to Fremont Brewery or Miir for drinks? So not only do you admit that we don’t have the available ridership numbers to justify building bike lanes on places likes 40th. You also admit that they’re mostly for the upper middle class (read: mostly tech bros riding bikes worth more than my car) to use them for exercise. Thanks for that, TJ. My work here here is done! So you agree that we should put more housing in the neighborhood so the poor can live here therefore utilizing the bike lanes more? We really can use more apartments in this neighborhood. The whole Wallingford should be mostly 5-story multi-family housing instead of Ballard. It’s a much more convenient location. If we don’t do that, we can just wait and most people like you will gradually disappear from this neighborhood actually. It’s obvious on my block that most of the houses are now sold over a million, and those who newly move in are surely nothing like who moved here ten, twenty, or more years ago. Sure TJ, I’m going support the destruction of my neighborhood just so a few of your hypothetical poor people can use your empty bike lanes. Fear not, though. I plan on staying here a long time just to be a thorn in the side to you urbanists. I will continue to be the happy warrior defending against the Ballardization of Wallingford and the takeover and destruction of my city by a bunch of Marxists. There is nothing hypothetical about poor people. They are real. And what do you mean by destruction? I am talking about building. And it kind of doesn’t matter if you stay or not. I should be obvious to you that how this neighborhood is changing. It’s a neighborhood with million dollar house and $2000 a month apartments now. The “destruction” isn’t done by Marxists but by capitalism. The neighborhood is resisting change through Marxist means, like zoning codes. If it’s not for government central planning measures like that, we’d have waterfront restaurants and highrises next to Gasworks already. I’ve owned homes on N. 40th St. for 34 years, I’m an avid cyclist (and neither poor nor anyone’s idea of a tech bro). But I’ve never ridden on 40th because it’s dangerous. But apparently letting me ride safely on a street where I own a home is not sufficiently important to you. So you can’t ride one block over, you *have* to be able to ride safely on the street where you live? Should it be that way for everyone all over the city? And how about outside the city? What about people who live on Aurora? Or say, Interlaken Blvd? Do we have to build them a bike lane too? How about I-5 then? Do we want bike riders to feel safe on the Ship Canal bridge? Gosh, its almost like SDOT is surprised that there was community pushback after they tried to sneak this bike lane in under our noses. Maybe they’ll learn there lesson and try to get approval from the neighborhood next time they try something like this. Hah, who am I kidding. N 40th is actually not so bad to bike on – downhill, it’s trivial to keep up with traffic, while going uphill I can just take the lane. A bike lane would be nice so I can feel better about the bus riders I’m delaying, but otherwise the status quo isn’t bad *for me*. The problem is that the street is dangerous for pedestrians, and less-confident cyclists who hug the curb, and they’re the ones who will suffer from this decision.